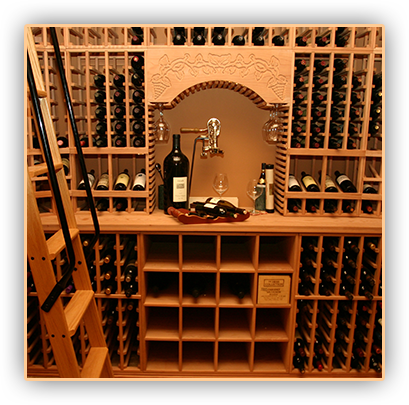 Wine storage and display racks are some of the most important components of building a wine cellar. They not only allow proper bottle placement during cellarage, but also provide efficient presentation and recognition of wines that are on display. 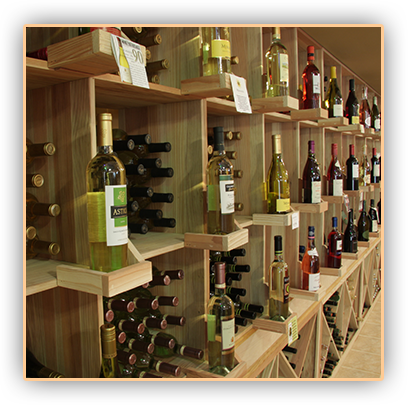 Wine cellar racks Illinois are available in a wide array of height, width, and depth options, that can address a variety of wine storage and display requirements. Custom wine cellar racks are specially designed to fit and adjust to the architectural structure and constraints of a wine storage space. 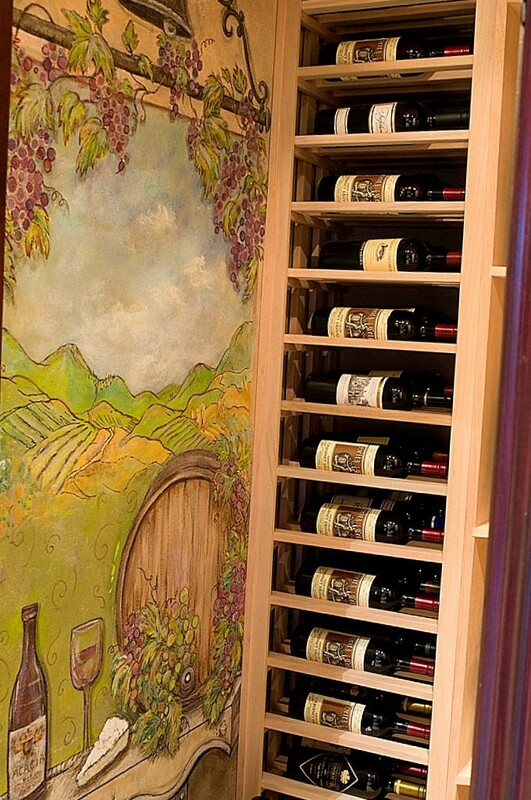 These wine racking systems are ideal for oddly-shaped wine rooms. 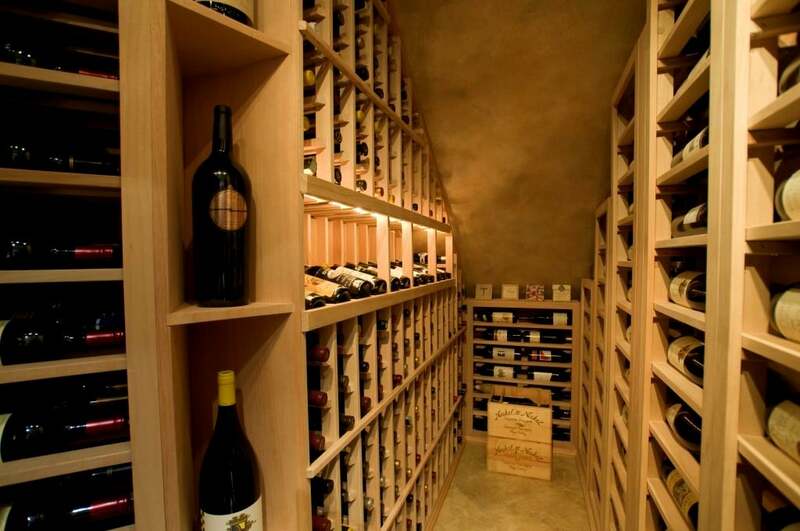 Take a look at this recently completed residential wine cellars Chicago Illinois project. The storage room was situated under the stairwell, hence the sloping ceiling and the unusually angled layout. Building a wine cellar and installing a wine cellar cooling unit in a small space with unusual contours was a major challenge in this residential wine cellars Chicago Illinois project. Our wine cellar design and construction team worked hand in hand to meet the wine storage needs of the client. In order to come up with the best wine display solution that also provides maximum storage capacity, the creative team at Custom Wine Cellars Chicago drafted several versions of three dimensional illustrations, or, 3D wine cellar design, until we found the ideal combination of wine cellar racks Illinois. The 3D drawings were sent to the client for viewing and approval. This gave the client the chance to see what his wine cellar would look like. A 3D wine cellar design package includes an overhead view and the different elevations of the proposed wine cellar project. It provides a preview of the finished product and allows designers to make any changes to the design. For this particular project, we combined various styles of wine cellar racks to store and display different wine bottle sizes, including standard 750ml wine bottles, magnums and double magnums. Starting off on the left side of the wall are floor to ceiling lattice-style horizontal wine cellar racks. They provide a label forward orientation of wine bottles, for easy identification and selection. Horizontal wine racks come in several depths. In this particular residential wine cellars project, the horizontal openings can store three bottles deep for increased wine storage capacity. Next to the lattice horizontal wine racking is a triangule shaped quarter round shelf that provides a place for showcasing large format bottles, such as double magnums and jeroboams. This display solution can also be used to feature decorative items and various wine accessories such as decanters and stemware sets. Aside from serving as a display option, the quarter round display rack also provides a charming and smooth transition between the lattice style horizontal displays and the single bottle wine racks. Just below where the ceiling slopes down is standard 750 ml wine cellar racks Illinois in a waterfall design to accommodate the change in ceiling height. A display row with high reveal was added to this particular area, in order to allow the client to feature some of his favorite wine labels. Installed LED lighting fixture in the display row illuminates the different bottles and casts a beautiful glow along the high reveal area. The wall opposite the standard 750 ml bottle racking is comprised of single deep horizontal openings, for label forward storage. The label forward wine cellar racks in this area come in a step-down design, to allow the racking system to adjust to the downward slope of the ceiling. 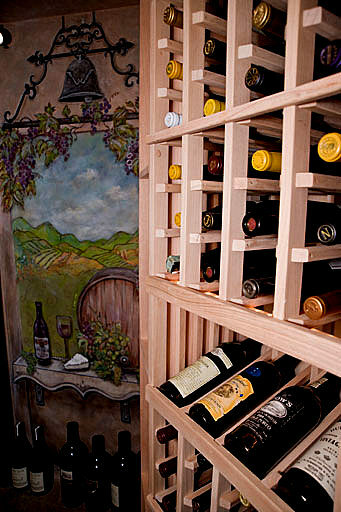 Nestled in the back wall of the residential wine room, additional bottle storage is featured, in a horizontal orientation. All wine storage and display racks in this residential wine cellars Chicago Illinois project are constructed from unfinished Mahogany. They all come with crown and base moldings that provide elegance and offer a personalized appearance to the racking solutions. 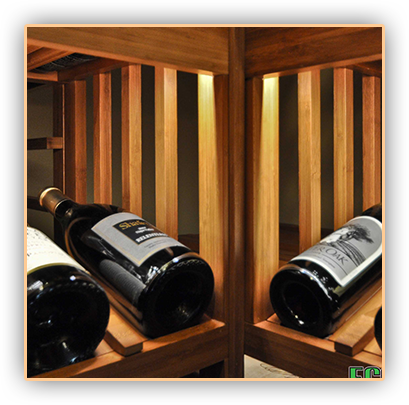 The addition of a toe-kick elevates the wine racks off the floor, and thereby protects bottles from damage. For this residential wine cellar project, an RM 2600 wine cellar cooling unit from US Cellar Systems was installed, to help maintain the ideal wine storage environment. The split system is encased in special housing, which is located right before the sloping part of the ceiling. The housing also comes with a grill cover that keeps the refrigeration equipment hidden from view. 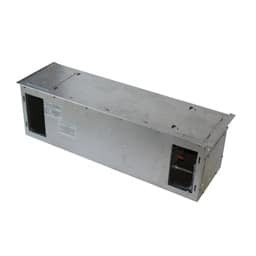 The RM (or Rack Mounted) Series from US Cellar Systems is a split cooling system that allows the condensing unit to be located remotely, thus providing whisper quiet and efficient operation. The evaporator unit is mounted in the wine room, usually within the racking frame, and is connected to the condensing unit by refrigeration lines. They are ideal for medium to high temperature locations. 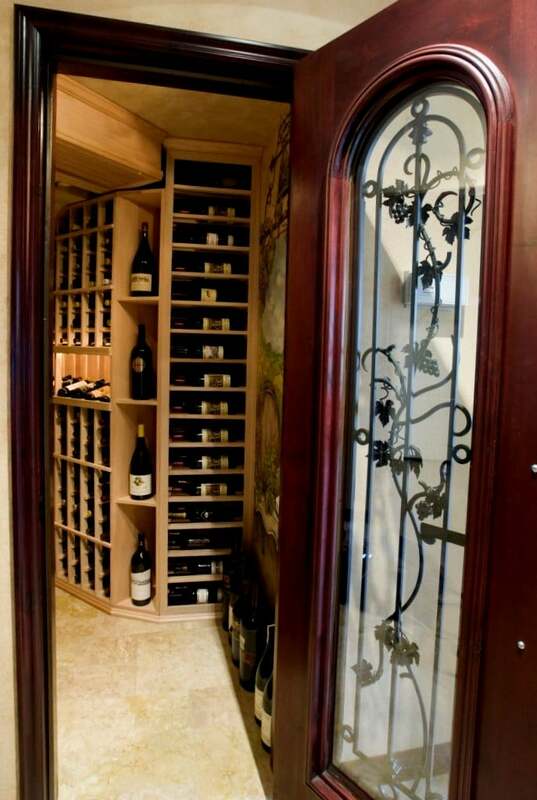 A Tuscan style wine cellar entry door completed the look of this residential wine cellars Chicago Illinois project. The entry door features arched dual pane glass and a wrought iron grill. For a customized look, the iron grill came with a detailed grapevine design, hand forged by skilled artisans. The client specifically chose an operable wrought iron grill type. This unique feature makes cleaning and maintenance of the door hassle-free. Building a wine cellar not only requires creating the best possible storage environment, putting together the right combination of custom wine rack styles, to promote effective wine presentation and provide optimum storage capacity. Regardless of the architectural challenges and constraints of the proposed residential wine cellars project, the right mix of wine rack design and configuration will help maximize limited space, as well as create a tasteful display solution. When building a wine cellar, it always helps to consult with a professional wine cellar expert who will provide guidance throughout the entirety phase of the project. 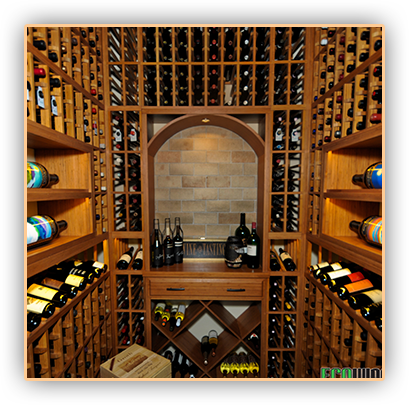 At Custom Wine Cellars Chicago, we provide a free wine cellar design Chicago service that includes consultation and a three dimensional drawing of the proposed wine cellar project, along with a complete quote.